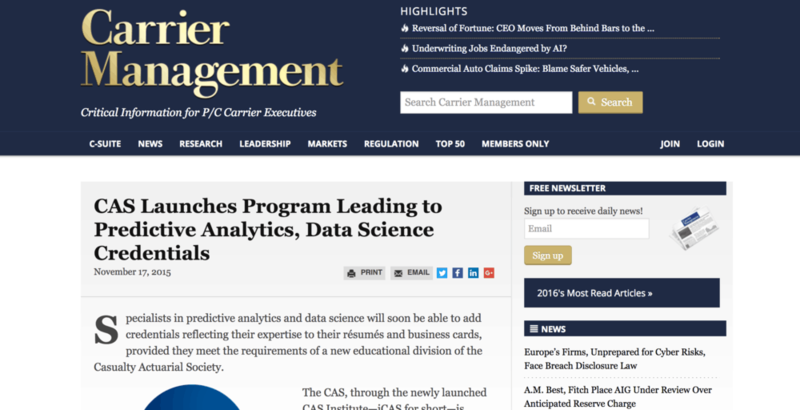 The Casualty Actuarial Society (CAS) fulfills its mission to advance actuarial science through a singular focus on research and education for property and casualty actuarial practice. Among its 6,700 members are experts in property and casualty insurance, reinsurance, finance, risk management, and enterprise risk management. Our work for the Casualty Actuarial Society began with establishing a foundation to build media relations and other proactive communications. We focused on aligning CAS’s communications activities with their organizational goals. Key Messages Development: Strategies cannot always be controlled; key messages can. Through a working session, we developed key messages that now serve as the foundation of CAS’s communications efforts, and are reflected in all written and spoken communications. Media Relations Foundation: We conducted regular media monitoring, developed targeted media list, and researched opportunities for media outreach. Digital Media Audit: We assessed CAS’s social media properties to provide best-practice guidance and align with traditional media engagement. Thought Leadership Campaign Through Media Relations: We conducted proactive media pitching and cultivation for showcasing CAS expertise. Spokesperson training for select CAS members. Identified relevant speaking opportunities and coordinated proposal submissions for CAS.